Mix flour, butter, powdered sugar and salt with hands until crumbly. Press firmly and evenly in bottom of ungreased 11-inch tart pan with removable bottom or 12-inch pizza pan. Bake 8 to 10 minutes or until light brown; cool. Remove side from tart pan if necessary. Mix sour cream, milk and pudding and pie filling (dry) with hand beater or electric mixer on low speed 1 to 2 minutes until blended; spread over crust. Arrange strawberries on pudding mixture. Heat marmalade and liqueur over low heat until melted. Cool slightly; spoon over strawberries. Immediately refrigerate any remaining dessert after serving. Use what you like! 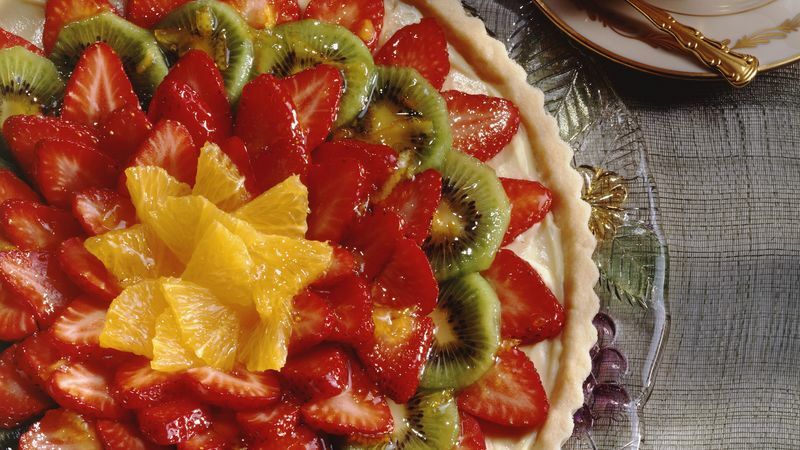 Try other fresh fruits, such as sliced bananas, kiwifruit, peaches and oranges, instead of the strawberries.